What do two recent articles published in the Nanaimo News Bulletin have in common? In one, the bees are disappearing in a book by a Nanaimo author. And in the other, the bees are reappearing in the parking lot of a Nanaimo shopping plaza. Coincidence? Perhaps. On the other hand, alchemy could be at play. After all, certain medieval poets believed their texts to comprise alchemical properties; why shouldn’t twenty-first century novelists? Alchemy or not, bee paraphernalia was certainly a highlight of the June 2 book launch for The Alchemists’ Council, which was held at the Nanaimo North branch of the Vancouver Island Regional Library. This shot features Paul Klan setting up the honeycombs and smoker he brought from his small apiary here in Nanaimo. Thank you also to Nicole Klan for suggesting this exquisite backdrop for the reading. Not only was it beautiful, but it provided a lovely honey-smoked scent! The bee-themed event did not end with the honeycomb. My friend and colleague Marni Stanley made cardamom-scented, bee-embossed cookies. And two of the attendees–Joy Gugeler and Melissa Stephens–wore bee-printed outfits! Note the beautiful bright blue bee in the corner of Joy’s skirt! And behold the stunning fabric in this close-up of Melissa’s dress! Door prizes featured jars of honey from Fredrich’s in Cedar and beeswax candles from The Hive in Duncan. Congratulations to door prize recipients Ross MacKay, Sean Gallagher, Lisa Holden, Janice Porteous, and Theresa Hartman. Honey from Cedar?! I wonder if Mr. Fredrich realizes that Cedar is also the name of one of The Alchemists’ Council‘s main characters? Perhaps Lapidarian honey will be available soon right here on Vancouver Island. Bee buttons advertising the book were also available thanks to ECW Press. And, of course, the book itself was the prima materia of the evening. My gratitude goes out to VIRL librarian Darby Love for arranging the reading. The space at the library was perfect. 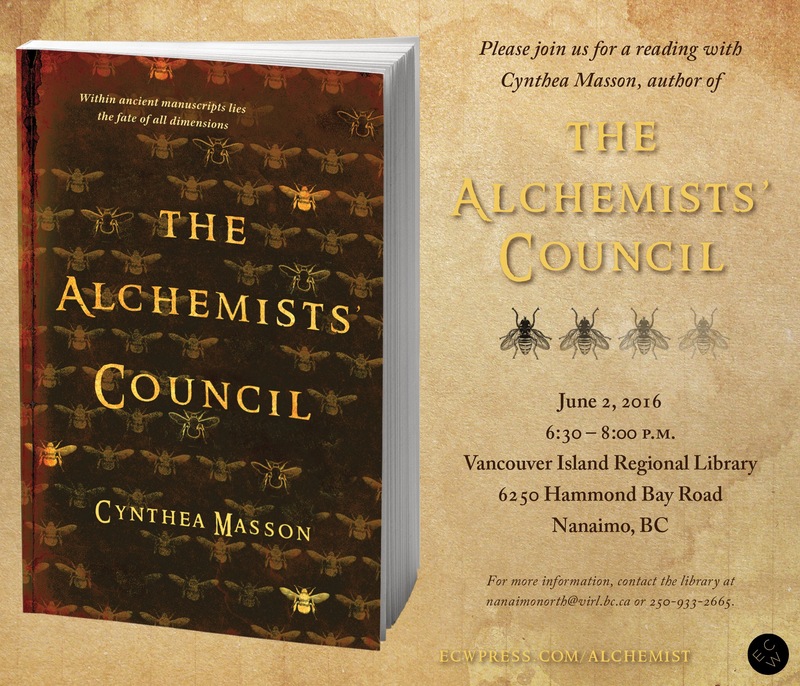 I hope to see other authors reading at the Nanaimo North branch in the upcoming months. Special thanks also goes to Joy Gugeler, Farah Moosa, Sonnet L’Abbé, Tami Joseph, and Kathryn Barnwell for helping with various tasks to make this first book launch a success. Finally, thank you to everyone who attended, bought books, laughed, smiled, and asked the most intriguing and thoughtful questions during the discussion period! Of course, disappearing bees are only one of the mysteries of The Alchemists’ Council. So please pick up a copy at your local or online bookstore, and enjoy some summer reading! And as you read, remember to keep an eye out for reappearing bees around you. They may indeed be emerging from recently published alchemical manuscripts.